There is definitely music in the air in Dublin for 365 days a year. Thanks to its young, fun loving population, Dublin is a favourite stop-over for many international superstars and hot, upcoming bands alike. With more than a dozen dedicated live music venues, there is a gig on virtually every night of the week. And that is not even counting in the many pubs, bars and cafes that stage concerts or the open air festivals that take place during the summer. Below you will find a guide to the best music venues in Dublin. The Academy is Dublin’s newest concert venue. Set in the former Spirit nightclub, it is a plush, intimate venue that attracts a trendy 30-something crowd. The Academy has a similar L’Acoustics sound rig to the Button Factory. From acoustic gigs to full-on alternative rock, most bands will sound good here. The Academy offers great views from the balcony, which sports its own bar and cosy booths. The Red Luas line stops practically in front of the Academy (Jervis stop). The Ambassador is the oldest venue in Dublin. Originally built in 1764 as part of the Rotunda Hospital, it was turned into a cinema in 1910. The faded 1950’s elegance you can see today stems from the last refurbishment. Today, the Ambassador is a charmingly grungy venue with loads of velvet curtains and red plushy seats. The mid-size venue holds 1,200 and hosts mainly successful alternative rock acts coming into town. Despite the booking policy, concerts here are strictly seated. The Button Factory is a rare thing, indeed - A swish venue with an alternative booking policy. Comfortable sofas and a bar right in view of the stage make this a great place to hang out. The look is minimalist lounge chic and the audience typically young and hip. The sound system by L’Acoustics is out of this world and ranks among the best in Dublin. The Button Factory also regularly books some of the hottest international DJs and the Friday and Saturday club nights at the Button Factory are well worth checking out. The Crawdaddy, named after the London club where the Rolling Stones made their stage debut, is a small basement venue with a very trendy booking policy. If there is any hot up-and-coming act on the Alternative or Dance scene, chances are they will play their Dublin debut here. The Crawdaddy is part of the POD complex in the disused former Harcourt Street train station. The POD also houses a larger disco and bar upstairs. The Green Luas line stops right outside the entrance to Crawdaddy (Harcourt Street stop). Dublin’s only dedicated Jazz venue perches on top of JJ Smyth’s pub in Aungier Street. JJ’s is all carefully polished 1950’s style with a nice, lived-in patina. The pub is a real, no-nonsense Dublin establishment that used to be frequented by Irish author Brendan Behan in the 1940’s and 1950’s. The literary connections reach even further back: This also happens to be the house that the poet Thomas Moore was born in, back in 1779. The atmospheric venue upstairs books some great Jazz and Blues acts. The National Stadium was built in 1939 as the first purpose-built boxing stadium in the world. The 2,000-seater hall still hosts boxing matches but has branched out into staging mainstream and alternative live music concerts. The O2 is one of Dublin’s premier indoor venues. Formerly known as The Point, Dublin’s first ‘big’ music venue, the one-time customs warehouse has been recently refurbished and turned into a high tech concert venue. Big, shiny and clean, the O2 is part of a larger shopping, office and apartment complex. The Red Luas line will eventually be extended to terminate in front of the O2. Until then, your best bet is to walk from the city centre or to take a taxi. Parking is severely restricted while construction work on the rest of the complex continues. If you are a regular visitor to Dublin, you can become a Premium Club Member of the O2 and enjoy fast track access, a private bar and options on tickets for sold out shows, all for €2,500 per year. This 19th century theatre turned concert venue attracts many international top acts breezing into Dublin. With its faded elegance and bashed stucco, the Olympia has a charm of its own. There is some standing space on the ground floor in front of the stage. Stalls and Circle are reserved seating and the Upper Circle has unreserved seating. The four bars are a good walk away from the stage, so pick your moment carefully. The Royal Dublin Society (RDS) show grounds are Dublin’s premier trade fair and exhibition venue. Due to its size and range of facilities, the RDS is the venue of choice for many international superstars coming to Ireland. The Main Hall has a capacity of 5,000, the Simmonscourt Pavilion seats up to 7,000 and the Stadium can cope with more than 35,000 fans. The Sugar Club is an intimate venue with a carefully studied, old-fashioned night club feel to it. With its Burmese Teak panelled walls and velvet seats, the Sugar Club could have seen Frankie and Dino coming in for a late one in the swinging 1960’s. Concerts at the Sugar Club tend to focus on the Funky side, hip Dance acts or happening singer-songwriters. The booking policy is fairly adventurous and stretch into cabaret, burlesque and more. Dublin’s newest night club, the Twisted Pepper, boasts a mellow vibe and a booking policy that brings the best underground Dance acts from around the world onto its small stage. The Twisted Pepper has space for 350 revellers on its main floor. If the show is any good, the audience will raise the roof at the Twisted Pepper! Concerts here typically start between 23:00 and midnight. Arrive early and you can enjoy a quiet drink at the bar. 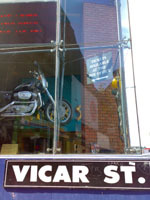 Voted best Dublin Venue 2008 and Best Irish Venue 2008 at a recent awards show held by Irish copyrights society IMRO, Vicar Street is a Dublin institution among live music venues. A popular medium-scale venue, it attracts many big name acts, particularly among Irish artists. The sound can be relatively quiet at Vicar Street and many concerts here are seated. The place is packed with rock memorabilia on the walls and the large bar is popular with a pre-concert crowd. The 123 bus from O’Connell Street or Dame Street stops close by on Thomas Street. This sleek bar and restaurant sits right at the top of Dublin’s newest entertainment mile of Wexford Street/Camden Street. The Village pulls a buzzing crowd into its long minimalist lounge, checking out Dublin’s DJ elite on the decks. The Village also hosts concerts in its backroom. If you are coming to see a concert here, please note that the entrance to the backroom is around the back of the block, not through the main bar. You are always guaranteed a crowd at this popular bar and concert hall. Whelan’s is the quintessential sweaty, heaving rock music venue. It attracts a young crowd from all over Dublin as well as trendy locals from Dublin’s newest nightlife strip, Wexford Street/Camden Street. Whelan’s has recently been totally refurbished and now features a brand new, decent sound system and good views from almost anywhere in the venue. The balcony has been widened and there’s a full bar upstairs now as well. Don’t get freaked out by the Stone Man, the life size statue of a lone Dublin drinker which props up the bar to your left just as you come in – He’s pretty life-like but definitely harmless.